I activated the Hattah-Kulkyne National Park on the 17th April, en route to Narooma in New South Wales, via Ouyen, Shepparton and Corryong. The Park is large: about 50,000 hectares. 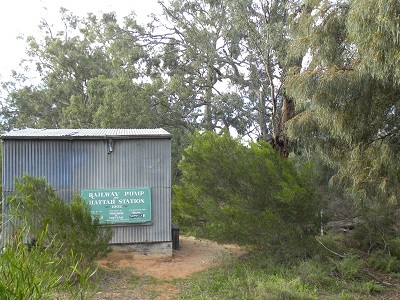 We took the Hattah Nature Drive which begins at the Lake Hattah Visitor Centre and stopped at the old pump-house which has been restored by volunteers. It provided a great spot for my activation. I used the low-level fence around the car-park to support my squid pole. The following contacts were made beginning at 06:20 UTC, VK3AMB, Bernard; VK5FAKV, Shawn; VK3FI, Noel; VK5LY, Larry; VK5KGP, Graham; VK5WK, Graham; VK5FEKH, Errol and VK4GJP, Geoff at 06:58. Eight contacts in 40 minutes and then the band went dead! However, there were plenty of nets in action although these don’t work well with QRP stations and I resisted the temptation to join various queues. Well it is a successful activation as far as the Keith Roget Memorial National Parks Award is concerned, but I needed another two contacts to creep over the line and count for the VKFF.